This tiny handmade triptych is meant to encourage hope and perseverance in anyone going through an unsettled or difficult time. Meant to be placed by a bedside or on a desk, the piece carries the simple mantra, "Pray, Hope, Don't Worry," which helps push one out of the present anxiety and toward thoughts of peace. I designed and carved the original of this tiny triptych. It is freestanding and has designs on both sides. I cast it in lead-free pewter. The front of the piece shows Padre Pio releasing a dove, symbol of peace, as he is surrounded by angels. The back has his signature words of counsel, "Pray, Hope, Don't Worry." The piece comes boxed with a history card that states the following: ""Padre Pio (1887-1968) was an Italian priest who had a huge influence as a spiritual guide and healer. Thousands came to him each year to be blessed and healed. As the years went by and more and more people asked for his counsel and direction, he distilled his advice into a series of simple suggestions, telling people that the way to liberation was to 'Pray, Hope, and Don't Worry.' It has become a helpful mantra to many people who are searching for meaning and peace. 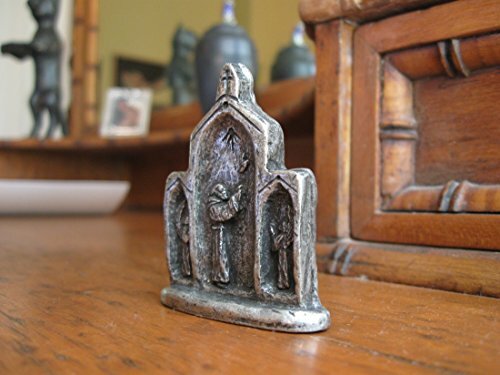 This small triptych was designed, carved, cast, and copyrighted by Hank Schlau at In the Company of Saints." Dimensions: 2 1/8 in. high x 1 7/8 wide x ¼ deep. If you have any problems with the piece, please let us know, and we'll resolve the matter quickly. Thank you, and saints be with you.